Join us in a trio of glorious Baltic capitals, each contrasting effervescent modernity with wonderfully preserved history, and each offering the delights of outdoor living, some of Europe’s cutting-edge cuisine and some memorable sights. Wander through compact, maritime Helsinki and after an enjoyable crossing to Estonia, discover Tallinn’s engaging charms, before heading south along the pristine coast, to complete a wonderful Baltic journey in Latvia’s cosmopolitan capital Riga. Flights also available from airports in England – Birmingham, Bristol, Cardiff, Dublin, Humberside, Leeds, Gatwick, Heathrow, Manchester & Durham Tees Valley – click here for more information on dates & prices. Fly to Helsinki, meet your tour manager and make the transfer to your four-star waterside hotel in the heart of the city. Rest and relax on arrival, perhaps taking your first Finnish sauna at the hotel, before exploring the harbour, with its market halls. Head into the compact city in search of dinner in a vast choice of establishments. Choose from an array of traditional Scandinavian fish restaurants and some of Europe’s most exciting new eateries. Drinks can be enjoyed in a similarly wide choice of watering holes. Depending on your arrival date, enjoy the late evening light. 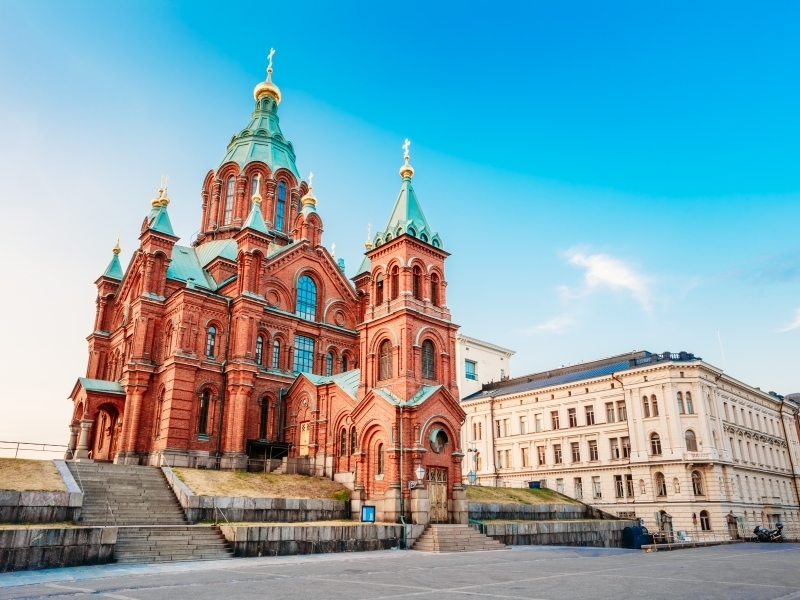 An included, guided excursion introduces the Finnish capital, which exudes maritime charm. See freshly landed fish in the historic Market Hall, perhaps enjoy a coffee and after a glimpse of stunning Senate Square’s great neo-Classical buildings, which doubled for Moscow’s in many a Cold War movie, take in the views of the city from the cathedral’s tower. After lunch, the afternoon is free – will it be the designer stores of the Toriquarters, the boutiques of trendy Kallio, a stroll by the water or a cruise to any of the 300 outlying islands that takes your fancy? Or join an optional excursion to exquisite Porvoo, Finland’s ancient, endlessly charming second city. Transfer to the quayside this morning to board the ferry for the two-and-a-half-hour to Estonian capital Tallinn. Upon arrival, transfer to your ultra-modern hotel close to the delightful Old Town, and enjoy your first taste of its delights. Originally a Danish stronghold built on Toompea Hill, the impossibly beautiful, UNESCO-listed heart of Tallinn is one of Europe’s most complete medieval gems. The city is no musty historical remnant, though, with vibrant café and cultural lives both thriving within the glorious setting. Another long, light evening, perhaps spent in the one of countless trendy eateries, completes a perfect day. Today begins with a tour of Tallinn in the company of a local guide, bringing to life the major sites, including the crowning glories of onion-domed Alexander Nevsky Cathedral and Toompea Castle. After the tour, explore the city under your own steam, perhaps taking in the view from the vertiginous TV Tower, or join the optional excursion to the Maarjamae Palace, a magnificent sea-side former summer residence built by a Russian count, which now houses the fascinating Estonian History Museum. Spend a second evening enjoying Tallinn’s lively atmosphere. Journey south today by coach along the scenic coast, pausing for lunch at Estonia’s celebrated beach resort, Parnu, before continuing to colourful, cosmopolitan capital Riga, for three nights. After checking into the hotel, enjoy your first evening in the Baltic states’ largest city, where a host of cafes, bars and restaurants cater to all tastes and pockets. A guided tour will lift the veil on fascinating Riga, a trading centre for centuries and now rushing headlong into the 21st century, with ultra-modern buildings springing up around its walled central core. Highlights include the lovingly reconstructed Dutch-influenced House of the Blackheads, Riga Castle, the beautifully restored Town Hall Square, two magnificent cathedrals and the Art Nouveau glories of the UNESCO-listed Quiet Centre district. This afternoon, join the optional excursion to the fascinating Ethnographic Open-Air Museum, a representation of 19th-century life in rural Latvia, in a beautiful forested setting, before enjoying another evening in Riga. A final included excursion heads into the beautiful landscape of the Gauja National Park, a forested, alpine refuge for elk, European bison and brown bears, amongst other species. Highlights of a wonderful day include the ornate Livonian Order castle at Sigulda and restored Turaida Castle. You’ll return to Riga to spend a last night in the city. Transfer to the airport for the return flight to the UK, after a wonderful ‘Baltic Cities’ tour.